How do the self-defense skills taught in Hapkido compare to those taught in other martial arts such as Taekwondo, Karate and BJJ? 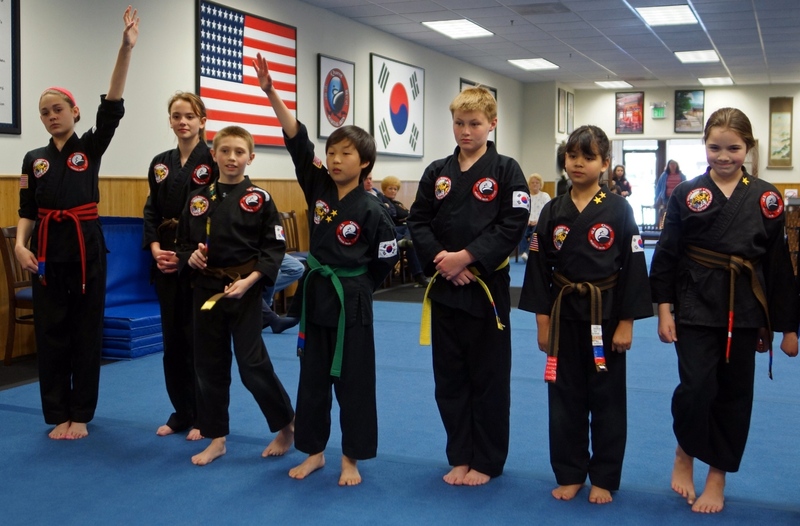 Most martial arts develop confidence, focus and self-control, but while many styles are more sport-oriented, Hapkido is self-defense-oriented - yet in a fun, safe environment. Hapkido offers the advantage of being able to defend yourself, both physically and mentally, should the necessity arise - a great skill to have whether you're being bullied, going away to college or simply finding yourself in an unexpectedly dangerous situation. A wonderful thing about Hapkido is that size doesn't matter. It's all about developing good technique and skill. Hapkido incorporates kicks, strikes, joint locks, throws, takedowns and ground grappling, making it one of the most versatile styles of martial arts. Hapkido was honed as the result of centuries of combat experience and, indeed, elements of it are practiced in special forces throughout the world today. Even though self-defense techniques replace the forms (shadow-boxing routines) of some martial arts styles, we follow the same sparring rules as for Tae Kwon Do, so any student interested in competing in tournaments is well-prepared to do so. Do Martial Arts help with bully prevention? It's been proven that martial arts can help with bullying, but not solely because of the physical self-defense skills. Students who train in martial arts develop the confidence needed to make them less of a target. Through our monthly themes, our younger students learn skills such as bully-prevention and conflict resolution which help them better handle difficult situations or people. Will I use weight training Hapkido? Our Adult Martial Arts classes often incorporate weight training into our warm ups to enhance our students' health and fitness levels. Our workouts are specifically designed to develop explosiveness, agility, strength, cardiovascular fitness, and flexibility. We design our workouts to be adjustable to our students' individual fitness levels, so while we will push you to do your best, you can workout to your own ability and pace. Can I train Hapkido and go the gym at the same time? Absolutely! Even though you'll receive a good workout during class, all efforts to get and stay in good health are encouraged! Many of our students complement their training by working out at a gym. Additionally, our adult students often get together outside of class for everything from gymnastics classes to trampolining at Sky Zone or other activities. How does the new student line up and work along the much more experienced higher belts? Our classes are not belt-specific. Any student may attend any class designed for his or her age group. While students line up according to rank at the beginning and end of each class, they mix it up during the class. Beginners may work together, but they may also train with higher level partners as well with each participant training at their own level. In fact we try to mix partners up so they get to know each other better. I have an injury / disability. Can I still train?? Hapkido is an amazingly adaptable style and we have experience training students with a variety of injuries and disabilities. We'd love to work with you to see how we can adapt our techniques and workouts to your particular needs. Is Hapkido a mixed martial art or MMA? Modern day Hapkido incorporates motions from Daito Ryu Aikijujutsu, Yudo (Korean Judo), Tae Kyun (a kicking style similar to Tae Kwon Do and Tang Soo Do), and several other martial arts making it one of the original “mixed” martial arts. The foundation of Hapkido, however, has roots going back over 4000 years, also making it a traditional martial art. Will martial arts make my child more violent or prone to fight? No! Martial arts is not about fighting or violence. It is about self-control. The confidence gained through martial arts will help your child keep a cool head and remain in control. Am I allowed to watch my child train?? Of course, or you may choose to sign up with your child. Families and friends that train together form close bonds and help each other stay motivated. In fact, Masters Jim and Debbie have trained together since Master Jim was 5 years old! One way martial arts helps to build tenacity is through the commitment you make when you sign up. Allowing your child out of his or her commitments teaches the child how to quit rather than how to overcome challenges. Everyone comes across times when it's hard to stick to their commitments and they need encouragement or sometimes even a push to help them stay motivated. It's far easier to relax in front of the television than it is to come to class, for example. But it's those who are able to overcome that challenge and develop the tenacity to come in and do their best, even on days that they don't feel like it, who are successful, not only in martial arts, but in all areas of life. Achieving any sort of goal requires consistent action toward those goals and the tenacity to never give up, to never quit. Will I be injured training at Quest Martial Arts?? Martial arts training is safer than almost any other sport. All activities are carefully monitored and students are required to wear protective equipment whenever engaging in contact activities. Additionally, we teach skills such as falling techniques which can help prevent injuries in your daily life.